The most important aspect of an online poker strategy is to understand that the game of poker is a battle. Therefore, just like a General who is at war needs a strategy to win the battle, a poker player needs a poker strategy to win the poker battles. The quicker you learn that poker is a game of skill and not of luck, the quicker you will become a better poker player. 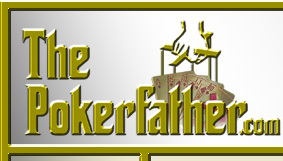 However, please don't misunderstand The Poker Father, it never hurts to have luck on your side (Trust Me!). Furthermore, it is also important to understand that an online poker strategy can be different from a real-life poker strategy; however, the fundamentals are very similar. •Good poker players know the basic percentages. Furthermore, they know that they have about a 12.5% chance of nailing a set when holding a pocket pair, and that they have about a 33% chance of completing a flush draw on the flop. •They also know how important 'outs' are. Outs, simply put, are the number of cards that can improve your current hand. A player should always be counting their outs by multiply them by two and then adding one. This is a rough percentage of hitting a better hand. •They the ability to figure out the 'pot odds.' Knowing outs is meaningless unless it's translated into rational, calculated betting. If you know you have a 20% chance of hitting, what do you do then? Well, simply once you figure out your chance of hitting/winning, you divide the size of the pot at the river (i.e. the current pot plus the amount of money that you think will be added through future bets) by the amount you have to put in. If you have a 20% chance of hitting and the bet to you is 50, if the pot at the river will be greater than 250, call. If not, fold. •Math skills is the most basic of poker knowledge. It should take about a day to understand. Anyone who doesn't understand these concepts should not play in a game until they do. Please view our Estimate Poker Odds Page to help your math skills. •Good poker players need an advantage. What will separate a winning poker player from an average player is that the typical player does not expect to win, while a strong player does. The typical player just hopes to get lucky. However, the good poker player does not "hope" to get lucky; he just "hopes" that no one else gets lucky. •Good poker players understand that different games require different disciplines. More specifically, a disciplined no limit player can be a foolish limit player and, of course, vice versa. A disciplined limit player is always very tight on the pre flop. They will not play too many hands, just the ones that have a very good chance of winning. However, a disciplined no limit player is VERY different. 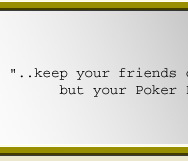 This player is not so concerned with paying too many blinds; instead, he or she does not want to get trapped. The main difference between a disciplined limit and no limit player is that the limit player avoids piddling away his stack bit by bit while a disciplined no limit player avoids losing his whole stack in one hand. Hence, a disciplined no limit player can play a lot of hands. Pre flop, he or she can be extremely loose and limp in with hands as odd as 35 off suit. However, a good no limit player knows when to toss hands that will get him or her in trouble. •A disciplined player knows when to play and when to quit. He recognizes when he is on tilt and is aware when a game is too juicy to just quit while ahead. •A disciplined player keeps track of his or her poker statistics (how much he or she wins/loses at various games). This is because a disciplined player tries to focus on the poker games that he or she excels at. •A disciplined player knows that he is not perfect. When a disciplined player makes a mistake, he learns. He does not blame others. He does not cry. He learns from the mistake and moves on. 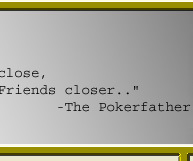 Hence: "keep your friends close, but your Poker Friends closer"
•Knowing the answer to these questions is the first step, manipulating the answers is the second and more important step. If you have a pair of kings and your foe has a pair of aces, and you both know what each other have and both know that you each know what the other has, why play a game of poker? A poker pro manipulates the latter two answers by slow playing, fast playing, and bluffing in order to throw his opponent off. •Good poker players know that psychology is much, much, much more important in a no limit game than in a limit one. Limit games often turn into math battles, while no limit games carry a strong psychology component. •Pot odds and demanding an advantage fall into this category. Poker players are willing to take a long shot risk if the reward is high enough, but only if the expected return is worth it. •More importantly, they understand the risk-vs-reward nature of the game outside of the actual poker room. They know how much bankroll they need to play, and how much money they need in reserve to cover other expenses in life. •Good poker players are fundamentally slightly risk-averse. In economics, a person is defined as risk-neutral, risk-averse, or risk-loving, depending on how that person rewards the next dollar they gain or lose. Risk loving are perfectly happy risking their entire roll on an even odds bet, a risk-neutral person is indifferent towards it, and a very risk-averse person would never risk his whole roll. Thus, a good poker player is slightly risk averse because he demands a big enough advantage to not be considered 'risk-neutral,' but he tends to value every dollar on the poker table equally. If you cannot afford to lose the entire amount of money you bring to a poker game, you should not be playing with that much money. Please don't think that poker is just a mathematical based game. A good poker player will also need to posses the skill of "Mind Games". Mind Games is an intangible asset that all Poker Players should have. The three most important Mind Games are Bluffing, Semi-Bluffing, and Slow playing. Contrary to popular belief, bluffing is almost useless in a low limit game (anything less than $2-4). Rarely will people not call to a showdown, so there is no point in scaring people out of the pot. I suggest waiting to bluff until you play at a higher limit. When you play at a higher limit, it's best to bluff when you 'represent' something and there are only one or two opponents in the pot. For example, betting at the flop with a high card on the board 'represents' a pair, raising when a flush is possible 'represents' the flush. Bluffing is also much more useful in a no-limit game than a limit game. Semi-bluffing is the same as bluffing except you possess a strong draw. Suppose you hold As Ks and the flop is Js 3s 4d. You currently only have ace high, but you may hit a spade flush or make a pair of aces or kings. Thus, if you bet with this hand, you are bluffing at the pot but have a high likelihood of possessing a strong hand on later betting rounds. Semi-bluffing is a very useful technique at times, especially in no-limit games. 2. You will only get action if some other cards come out that will improve your opponents' hands. Nonetheless, these cards are not good enough to make their hands beat your hand.